The global economic crisis that has paralyzed world development since the end of World War II makes the thoughtful individual ask: does modern-day economic theory really understand what a human economy is? What if it were the metrics we use to measure an economy, like money, or supply and demand that are the problem, and not something inherent to the economy itself? If we are going to create a functioning and just global economy, more money or mere ‘regulations’ won’t cut it. Only the introduction of a new, higher conception of the physical principles driving economic development can guarantee an economic renaissance. Lyndon LaRouche’s discovery of the concept of Energy-flux density provides a revolutionary step forward in that direction. While the increase of energy-flux density is familiar to economic practice throughout history, the conscious application of EFD as the measurement subsuming all other economic measurements is a new contribution to economic science. This is not something you will find on a wikipedia page or in an economics textbook. The short video below serves as our introduction to this new and advanced concept. Using the relationships between a series of nested cones as a heuristic device, this short pedagogical video demonstrates to the viewer the pervasive, anti-entropic characteristic of the universe around you, a characteristic whose metric can be defined by increases or decreases in energy-flux density. The history of mankind begins with fire. The most important first evidence of a distinction between mankind and a species of apes comes with first appearance of ancient fire pits, used to control the power of fire for the betterment of the conditions of life of those wielding that new power. From that time onward, mankind could no longer be characterized biologically or by biological evolution–the evolution of the creative mental powers unique to the human mind became the determining factor. Biology took a backseat to the increased power of thought wielded by the human species. This is the secret–and science–of economic growth, and is expressed in the control over successively higher forms of fire. This started with transitions from successively more energy dense forms of chemical combustion, from wood burning (and charcoal), to coal (and coke), to petroleum and natural gas. The developments around the end of the 19th century showed mankind an immense potential beyond chemical reactions, the fundamental equivalence of matter and energy, as expressed in the domains of fission, fusion, and matter-antimatter reactions, each with qualitatively higher energy densities. Control over higher energy densities drives the increase in what Lyndon LaRouche has identified as the energy flux density of the economy, as can be measured by the rate of energy use per person and per unit area of the economy as a whole. This increasing power per capita and per area drives qualitative changes throughout the entire society–creating fundamentally new technologies, new resources bases, new levels of living standards, and, actually, new economies. 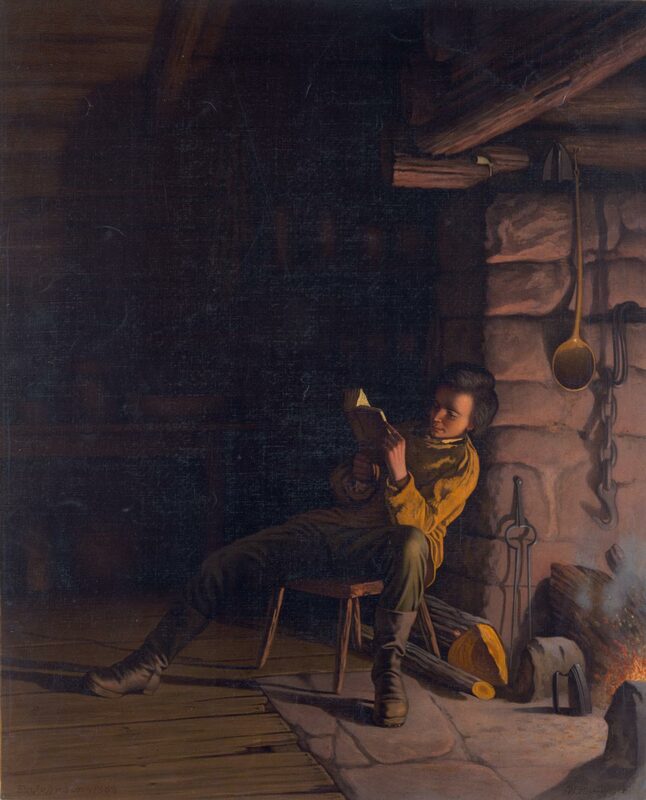 Abe Lincoln as a boy, reading by firelight in the Kentucky frontier. For example, start with the simple rate of biological energy usage for the human body, about 100 watts (as sustained by eating a standard 2,000 calorie a day diet). Assuming a hypothetical pre-fire civilization in which everything is done by human muscle, the power employed to sustain the “economy”–the power of labor–is only 100 watts per capita. Compare this with the growing per capita power usage throughout the history of the United States. At the time of the nation’s founding, the wood-based economy provided around 3,000 watts per capita, a thirty-fold increase over the muscle power of a fireless society. Then the widespread use of coal throughout the economy increased the power per capita to over 5,000 watts by the 1920s, and the implementation of petroleum and natural gas brought this to over 10,000 watts by 1970–100 times the per capita power of our hypothetical fireless society. 184 Cyclotron. Built as part of the Manhattan Project in 1942, this device was used to enrich Uranium. 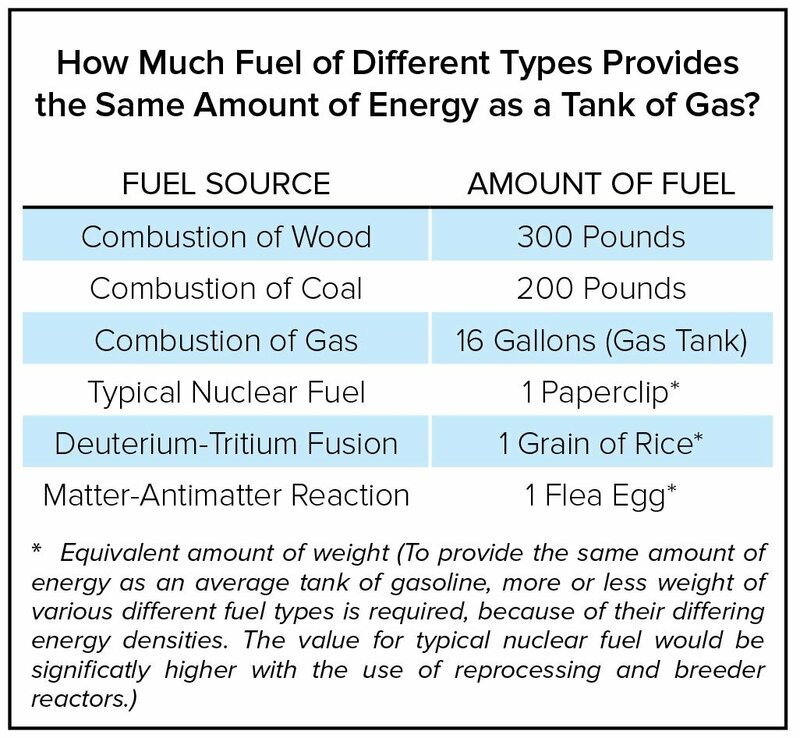 With each succession, the previous fuel base declines as a power source (allowing it to be used for things other than combustion, as wood is used for construction, and petroleum needs to be used for plastics and related non-combustible products of the petrochemical industry). Following the post-World War II developments, nuclear fission power was fully capable of sustaining this growth rate into the 21st Century. In a conservative estimate based upon previous growth rates and the potentials of nuclear power, this should have brought the U.S. economy to a level in the range of 20,000 watts per capita by sometime before the year 2000. 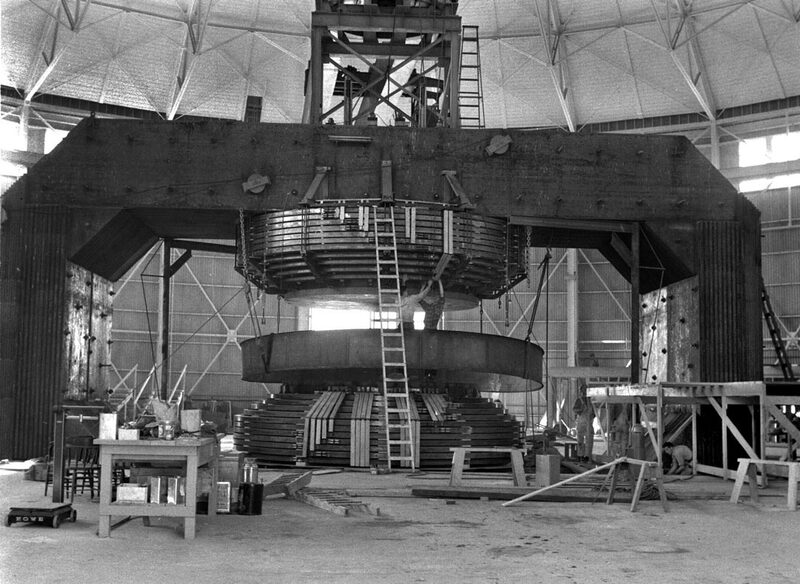 By then, assuming the nation had maintained a pro-growth orientation, as fission power was becoming the dominant power source, the beginnings of applied fusion power should have begun to emerge. With ocean water becoming an effectively limitless fuel source for fusion reactors, the U.S. economy would have been on a path to an energy flux density of around 40,000 watts per capita, and beyond, in the first generation of the 21st Century. Again, this would not simply be more power for the same economy, but a fundamentally new economy. However, this natural growth process was halted with the takeover of the anti-progress environmentalist movement, a shift, then, which sent the economy on the direct path into the attritional collapse being experienced, now–a collapse process accelerated by imposing policies which lowered the energy flux density of the economy. Per capita power consumption for the United States from 1780 to 2010, divided by the major sources of power. The general growth trend is clear, until 1970, when the zero-growth insanity took over the United States. Two projections indicate what could and should have happened. Curve A is a 1962 projection made by the John F. Kennedy administration, which focused on the then-coming role of nuclear fission power. Curve B is an estimation of what was possible if the Kennedy vision had been pursued, followed by the development of controlled thermonuclear fusion (following the 1970s realization of the feasibility of fusion). These two curves, compared with the actual levels, show the 40-year growth gap which is a major source of the current economic collapse. 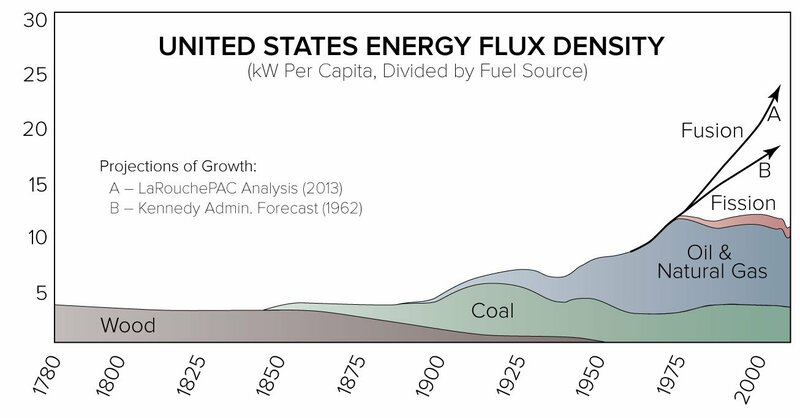 As is clear in the following graph, nuclear fission power was never allowed to realize its full potential, and the energy flux density of the economy stagnated and began to collapse. While the actual implementation of nuclear fission is seen in the red sliver, the role it needed to play is indicated in the gray wedge above, a projected value which keeps with the natural growth rates of a progressing human economy, and includes the beginnings of a fusion economy as well. The 40-year gap between the needed growth rate and the present levels expresses the source of the current economic breakdown, and demonstrates the immediate need for a crash program to develop and implement the next stage, the fusion economy, to overcome decades of lost time by creating a new economy at a higher level than ever before. Mankind's existence is based on the fact that mankind is the only species of which we know, which has the willfull power to increase the energy-flux-density of life as a whole, on our planet Earth, and beyond. LaRouche sets the record straight: everything in nature, in the solar system and beyond, demonstrates that the 2nd law of thermodynamics is a fraud. The world around us is constantly developing and evolving. Therefore in this environment, wind mills and solar panels are the pollution, not a technologically advancing mankind. "This is not an academic debate: the governing beliefs in science and society have real-life consequences and effects. As Vernadsky clearly knew from his unique work on the concept of the noösphere, human progress can be studied in terms of the physical effects of scientific and cultural thoughts and discoveries. There are knowable benefits, or losses, resulting from either the success, or failures, of humanity to progress scientifically and technologically." Over the period 1948-1952, Lyndon LaRouche solidified a fundamental advancement in economic science, a breakthrough which allowed him to become the most accurate economic forecaster of our day.1 This breakthrough in understanding what Treasury Secretary Alexander Hamilton called “the productive powers of labor” allows him to offer uniquely competent guidance on global economic matters. Here we elucidate several key concepts of LaRouche’s economic method, including, most centrally, that of energy-flux density as a measure of economic value. The story of the Olympian god Zeus and Prometheus the Fire-Bringer is not fictional, not a piece of idle drama. Here we find the most pure expression of the fight that has dominated large-scale political and economic conflict throughout mankind’s existence. We find the essence of the confrontation between an oligarchical outlook, in which some few rulers maintain capricious power over (preferably stupefied) masses, and the humanist outlook— in which the true identity of every human being as a potential genius is embraced and in which providing the opportunity (physical, moral, and emotional) for every individual to lead a functionally immortal life is the ultimate goal. The report you are about to experience was produced to make clear why LaRouche refers to his economic forecasting methodology as the “LaRouche-Riemann Method.” In doing so, we’ll explore the central feature of economics: our characteristic activity, as a species, is built upon mankind’s willful implementation of creative discoveries which re-define our relationship to the universe around us. VIDEO: Resources are not fixed, and are in no way limited. Rather, the amount and energy density of the resources currently in use at any time reflect the level of advancement of society. This is the way to understand the current shift to a fusion based society.